"The LEICA M9 is the smallest, lightest, highest-quality digital camera ever created by the hand of Man. The all-metal LEICA M9 is less expensive than the old Nikon D3X, and weighs over four ounces (120g) less than the plastic Nikon D90! The M9 weighs only 2.4 oz (69g) more than the dinkiest Nikon D40! The LEICA M9 is the most important digital camera introduced since the Nikon D1, the world's first practical DSLR, in 1999. The LEICA M9 is a rangefinder camera, not an SLR. 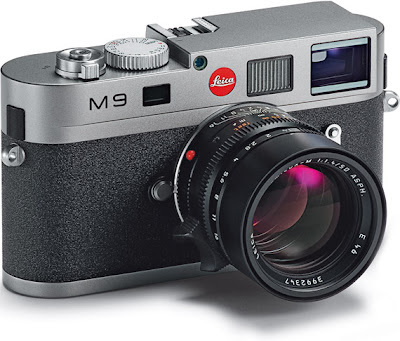 The LEICA M9 is the world's best digital camera for travel, nature, landscape, interior and outdoor photography." And I want one. But it costs almost £5,000 or over $8,000. Not including additional lenses. My attachment to the Leica stems from my dad's beloved Leica M3 which I grew up with - which has also become the inspiration for the styling of my iPhone App. So my challenge is to obtain this camera under my wife's financial radar. She would never let me spend this much money on a camera let alone a car. Although she did say she would get me one for my 50th birthday. I responded that if I didn't live to my 50th birthday she would spend the rest of her life guilt ridden about not having bought me the M9 when I asked for it. Predictably, she was having none of this. So with resolve strengthened, I did a little research on-line and established that a gentleman called Christian Cerhardt is the US Marketing Director for Leica cameras. And late last night when everyone was in bed I crafted a carefully worded email to him with, 'I want an M9 - sorry for getting in touch like this,' in the subject box. In short, I offered an attractive barter/exchange. I would carry out a segmentation animation study for him to the value (and slightly over) of a Leica M9 with a few accessories. He hasn't replied yet. I wonder if he will. I wonder if I will receive an email saying, 'let's meet when you are in NJ next week...' That would be amazing. I will keep you posted on my progress. Stay tuned.